Kick-off an amazing summer stay-cation at First Friday in June! 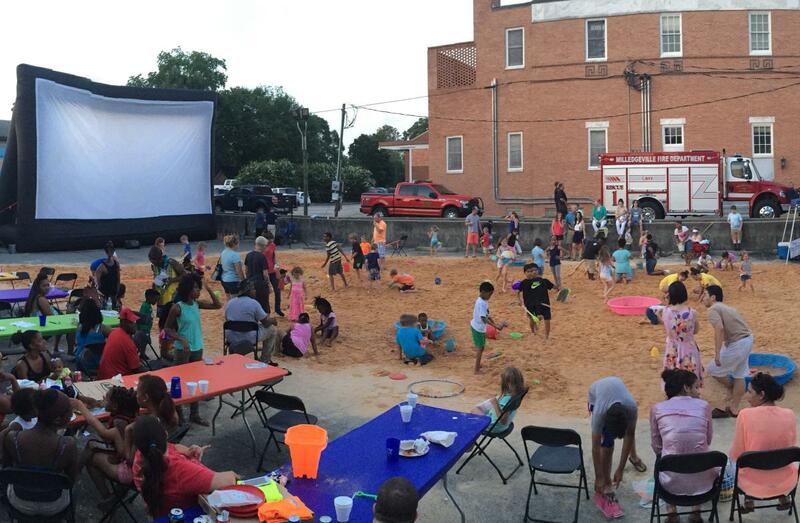 Milledgeville Main Street is bringing the beach to downtown Milly for the sixth annual First Friday Beach Bash. Standard Sand and Silica Co. and Fowler Flemister have pledged 80 tons of sand to be dropped in the Post Office parking lot on June 2nd, where the area will be transformed into a coastal oasis. Parents are encouraged to bring beach chairs because the kiddos will not want to leave! The First Friday Committee will supply a variety of beach toys for the event, but also suggest First Friday patrons to bring their own. Tables, chairs and restrooms will all be on-site during the event. The Beach Bash will kick-off at 5pm and run well into the evening. Attendees are encouraged to stay late and get cozy with their feet in the sand for the Beach Bash movie. On the big screen this year will be “Moana”, “Moana” a sweeping, CG-animated feature film about an adventurous teenager who is inspired to leave the safety and security of her island on a daring journey to save her people. The movie will start at dark and the Milledgeville Jaycees will be on site with freshly popped popcorn. The Milledgeville Jaycee’s provide development opportunities that empower young people to create positive change in our community. Stay cool at the beach with a tasty treat provided by LOVE for Haiti. They will be selling yummy snow cones during the Beach Bash to help raise money for a non-government elementary school in Montrouis, Haiti. LOVE. for Haiti strives to improve Life, Opportunity, Verse, and Education in Haiti. First Friday favorite, Lisa Marie will be transforming the kiddos into their favorite superhero or mermaid with her incredible face paintings while jamming out to “sand-sational” beach tunes all evening long. To make the Beach Bash even more enjoyable, Champion First Friday sponsor, Magnolia State Bank will be giving away frisbees and sunglasses. They will be doing drawings for the new MSB t-shirt and a MSB insulated picnic basket filled with various other giveaways. New to the Beach Bash this year is a dunk tank! First Friday goers can take their shot at some of Milledgeville’s finest. Step up to the plate with four tries for only $2. The dunk tank has been graciously donated by the Party Jumpers. Downtown Milledgeville’s newest business, The Mod Podge Mama would love for visitors to stop by and check out what she will have to offer Milledgeville! The Mod Podge Mama is opening an art studio on N. Wayne Street. First Friday will be a great time to see the “before” of this creative space. She will also have a fun beach themed craft for kids to take part in. Catch live jazz music at Buffington’s beginning at 6:30pm and Downtown Abby will be running a special on their bath bombs which can be purchased at the Beach Bash. Others providing additional fun to the Beach Bash include the Exchange Club of Milledgeville, The City of Milledgeville FOG program, The Ceramic Lady, Edward Jones Financial Advisor and The Baldwin County FFA Alumni. This event is made possible by the generous donation of sand from Standard Sand and Silica Co., delivery by Fowler Flemister, and removal and clean up handled by the City of Milledgeville Public Works Department. Special thanks to our wonderful Champion First Friday Sponsors Robins Financial Credit Union and Magnolia State Bank. These sponsors and partners deserve a huge thank you! For more information on First Friday and the Beach Bash contact the Milledgeville Main Street Office, 478.414.4014. PLEASE NOTE THAT IN THE CASE OF RAIN, THE EVENT WILL BE RESCHEDULED FOR A LATER DATE. PLEASE CHECK THE FACEBOOK PAGE, MILLEDGEVILLE MAIN STREET ON FRIDAY, JUNE 2nd FOR UPDATES AND CANCELLATION NOTICE.